Happy Holidays from all of us at Washington Crossing Advisors and Happy New Year! We first learned about the President’s tax plan a year ago. At that time, we had few details on which to base a forecast. Still, we anticipated that the plan could give a boost to the economy, especially through encouraging investment. The bipartisan Tax Foundation also looked at the early proposal and initially added roughly 0.75% to their baseline growth expectation. We raised our own long-run forecast by 0.25%. With the bill fully fleshed out, the Tax Foundation has come in with an updated analysis of the plan’s economic impact. In their updated view, the changes should add approximately 0.3% to growth versus their expected growth rate assuming no change in tax law. Their report titled Preliminary Details and Analysis of the Tax Cuts and Jobs Act highlights three important impacts on the economy. First, they see GDP getting a $5 trillion boost over the next ten years from the plan. Second, they project a 1.5% jump in wages, which could attract more workers into the labor force further encouraging growth (the Tax Foundation estimates 339,000 additional full-time jobs as a result of this bill). Third, they project that the stock of invested capital will be 4.8% larger and provide a needed boost to investment. 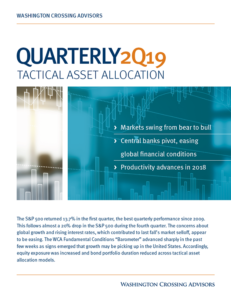 With greater growth in investment and labor contributing to higher growth, we believe the longer-run expected return for equities is also helped. However, we are mindful that the anticipated bump in growth and increase in expected after tax earnings are to a large extent already discounted into prices. 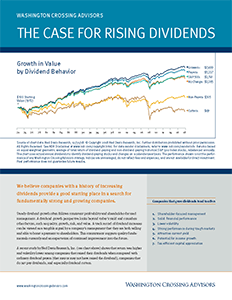 By our math, a 0.25% increase in long-term growth lifts equities roughly 30%. This very rough estimate has largely been fulfilled over the past year as the S&P is up roughly 28% from just after the election. Ultimately, we see that the fulfillment of the President’s tax pledge moves the government’s fiscal stance toward a more expansionary footing, and raises the economy’s longer-term growth rate. For an economy that had been mired in slow growth, the addition of capital friendly tax cuts to an improving growth picture is a nice way to wrap up 2017. Best wishes for a happy, healthy, and prosperous 2018!